Formerly the Women’s Leadership Conference, we’ve rebranded and retooled this very successful, high-energy conference to further connect and inspire women in banking. Changes this year include an additional speed networking session and a new Women in Banking Panel that includes Jodi Richard, U.S. Bank; Laurie Nordquist, Wells Fargo; Del Mari Runck, Neighborhood National Bank and Mary Kay Bates, Bank Midwest. Last, but not least, we’re adding a community impact food drive in support of Alexandra House. 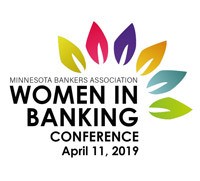 Be sure to check out the conference website at www.minnbankers.com/womeninbanking for the complete agenda and to register! Lodging arrangements can be made at the Marriott Minneapolis West for Wednesday, April 10, at a discounted group rate of $149 plus tax until March 18, 2019, by going to the Personalized Group Webpage. Employees of qualified non-member banks are encouraged to apply. Please call our office for further information.